A new analysis breaks down the likely social cost of carbon emissions by country and should make unhappy reading for politicians. Politics, according to the nineteenth-century German statesman Otto von Bismarck, is the art of the next best. The global approach of politicians to tackling climate change is a sorry example of this. The problem: destructive storms that hit the United States and southeast Asia this month are the latest reminder of how vulnerable societies across the world are to climate extremes. The best political solution might seem to be to subordinate all policies — domestic and international — to the goal of stabilizing Earth’s climate. This is difficult. So, instead, the world must rely on the effectiveness of voluntary actions that nations have agreed on under a non-binding international compromise treaty forged in Paris in 2015. For all its symbolic power, that Paris treaty is a truly second-best solution. Even if it had worked as advertised, the promised cuts in greenhouse-gas emissions are weak. And now the withdrawal of the United States — and, de facto, of Australia — has substantially weakened the global consensus before the treaty has even come into effect. Discussions on how and when it will start will resume at a two-week United Nations meeting in December in Katowice, Poland. Those attending would do well to read a study published this week in Nature Climate Change that highlights just how irrational it is for the politicians who represent many large economies to settle for next best (K. Ricke et al. Nature Clim. Change http://doi.org/ct7x; 2018). The analysis revisits the concept of the social cost of carbon: the cumulative economic impact of global warming caused by (or attributed to) each tonne of the pollutant sent into the atmosphere. This study goes a step further than previous ones and estimates the likely cost to different countries. In doing so, it reveals the countries projected to take the hardest hits. 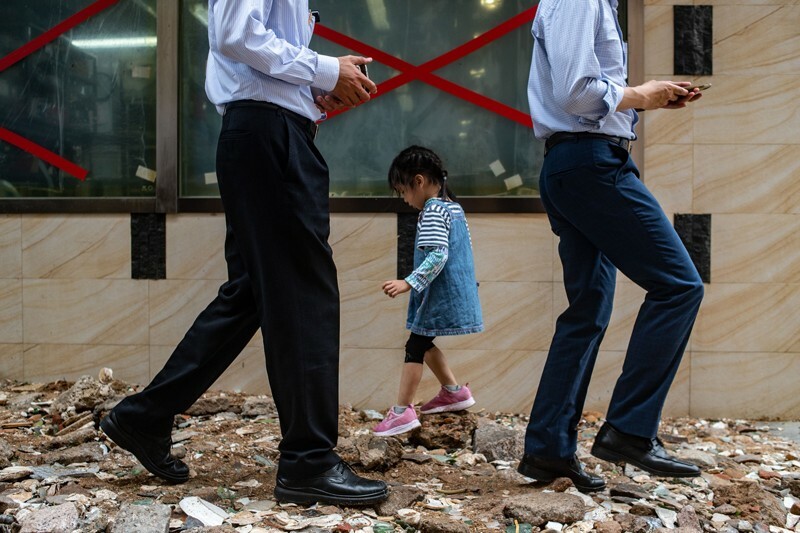 China and the United States, the world’s two largest emitters of carbon dioxide, will incur some of the highest social costs of carbon of all countries, the scientists report, with respective estimated impacts of US$24 per tonne and $48 per tonne. India, Saudi Arabia and Brazil also feature towards the top. In these countries — unlike in Canada, northern Europe and Russia — temperatures are already above the economic optimum. And climate-induced damage increases with wealth and economic growth, meaning that more-valuable property might sit in harm’s way. 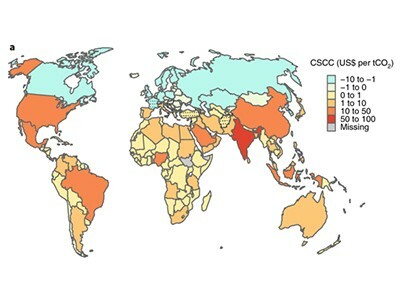 Combined country-level costs (and benefits) add up to a global median of more than $400 in social costs per tonne of CO2 — more than twice previous estimates. On the basis of CO2 emissions in 2017, that’s a global impact of more than $16 trillion. The new analysis is based on a set of climate simulations, rather than a single climate model, and the authors calculated future harm using empirical damage functions that were independently developed for that purpose. The revised costs are still ballpark figures, based on relatively uncertain assumptions on climate physics, emission trajectories, socio-economic development and climate-driven economic damage. In fact, climate change could also have impacts on international trade, security and human migration that calculations of the social costs of carbon don’t capture. But the concept is valuable, nonetheless. Acting like a magnifying glass, it highlights horrendous climate-impact inequality. For example, whereas Canada and Russia are still gaining economic benefits worth up to $10 per tonne of CO2 from rising temperatures, India is already paying an exorbitant price ($86 per tonne). It also shows that the way in which society currently prices carbon (as a means of reducing its use and protecting future generations) is an order of magnitude too low. The current price of carbon on the European market is just over $20. And in most other parts of the world, it’s effectively zero. The new analysis sends a powerful message from a future that most people say they want to avoid. In response, will politicians up their ambition and aim for the best — and necessary — solution? The paper unfortunately comes too late to be included in the special report from the Intergovermental Panel on Climate Change on the effects of 1.5 °C in global warming, due to be published next month. But it adds to the growing body of research that unpicks that global effect, and breaks it down into regions and countries. This will be needed to plan mitigation and also to prepare for adaptation. One government that should pay particular attention to the latest work is that of the United States, where the social cost of carbon has been taken into account in policymaking — for example, in car standards. President Donald Trump’s advisers have previously challenged cost estimates used by the US Environmental Protection Agency as being too high. The revised calculations suggest that the opposite is the case. How do natural hazards cascade to cause disasters?